Of the hundreds of studies conducted on the employment effects of a minimum wage increase, the majority find no evidence of significant job losses. Jordan Brennan Economist with Unifor, Research Associate of the Canadian Centre for Policy Alternatives and Visiting Research Fellow at Harvard Law School. 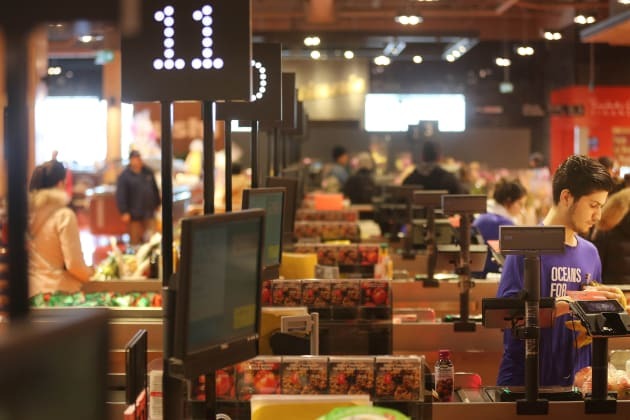 The stern rebuke issued by some business groups over the proposed minimum wage increase is out of step with both popular opinion and with the bulk of economic research. Polling indicates that a strong majority of Torontonians support a $15 legislated minimum (70 per cent overall, including 84 per cent of low-wage workers). The Ontario Chamber of Commerce and Canadian Federation of Independent Business, for their part, have called on the government to undertake a cost-benefit analysis before proceeding. Fortunately, the minimum wage is one of the most studied topics in economics. And while Canadians have been subject to some splashy headlines courtesy of a recent University of Washington study, which found that Seattle's move to implement a $15 minimum wage (nearly $20 Canadian dollars) led to a reduction in both employment and weekly earnings among low-wage workers, we should not put too much emphasis on a single study. From a policy perspective, what matters is the majority opinion in a field of study. Of the hundreds of studies that have been conducted on the employment effects of a minimum wage increase, the majority find no evidence of significant job losses. Even when the studies zero in on those segments of the labour market where low-wage workers are over-represented -- such as retail, hospitality and young workers -- there is no evidence of significant job losses over long spans of time in North America or Europe. A $15 minimum wage will likely alleviate poverty, including working poverty, reduce income inequality and boost employment stability. 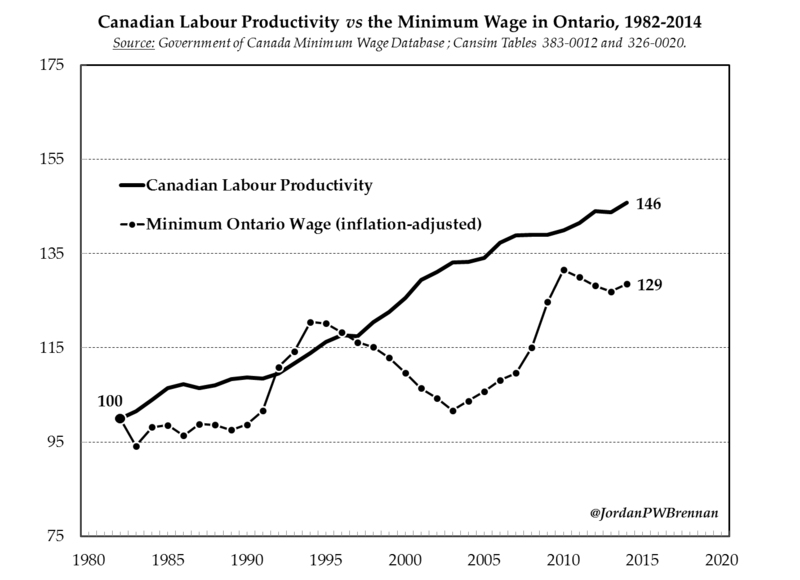 Economist Jim Stanford and I conducted an analysis of the minimum wage's employment impact in all 10 Canadian provinces over a 30-year period. Having examined seven different measures of employment and unemployment in our 2014 report, we could not find any indication of job destruction arising from an increase to the minimum wage. A recent study of all 50 U.S. states over four decades reached the same conclusion: the overall employment effect from a minimum wage hike is "close to zero." If the research does not point to job losses, what does it say? University of British Columbia economics professor, David Green, argues that a $15 minimum wage will likely alleviate poverty, including working poverty, reduce income inequality (including the gender pay gap, I might add) and boost employment stability. Professor Green speculates that an increase in the statutory minimum wage incentivizes firms to invest more in employee training, which reduces turnover. And yet some people will still find grounds to object to a higher minimum wage, either because it upends their belief in the "efficiency" of the free market or because it offends their sense that unhindered market exchange is the best guarantee of fairness. But this sentiment, too, is difficult to square with the facts. Over the past three decades average annual economic growth in Canada (adjusted for inflation and population) was 1.5 per cent and annual labour productivity growth averaged 1.2 per cent. How have these gains been shared? 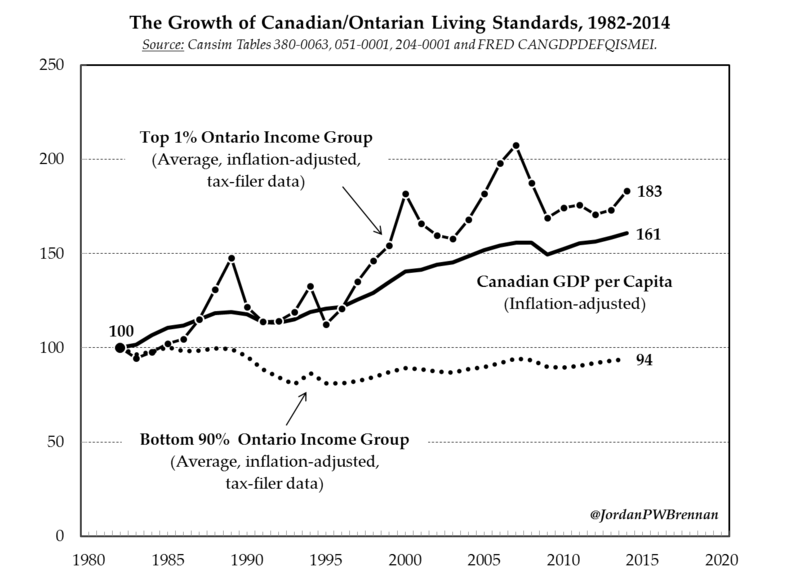 Ontario's top percentile income group -- the fabled "one per cent" -- saw average income gains of 1.9 per cent per year, which was much faster than the overall personal income growth rate. The top 10 per cent of Ontarians fared reasonably well, too, having experienced average income gains of one per cent per year. It's up to government to spread the gains from economic growth, otherwise they concentrate at the top. But that's where the good news story ends. The bottom 90 per cent of Ontario's income tax filers saw their inflation-adjusted market incomes shrink by 0.2 per cent per year over the past three decades. You read that correctly: even in the context of a growing economy and rising labour productivity, nine out of 10 Ontarian tax filers are worse off today than 30 years ago. When we factor in the effect of government transfers, the bottom 90 per cent of Ontario tax filers saw their inflation-adjusted incomes rise by a mere 0.1 per cent per year, which is small enough to qualify as a rounding error. In the absence of strong unions and other redistributive mechanisms (like the minimum wage), there is simply no reason to assume that the benefits arising from technological change or productivity improvements will be widely shared. In a labour market scenario as lopsided as the one we have witnessed in Ontario, it's up to government to spread the gains from economic growth, otherwise they concentrate at the top. A $15 minimum wage will go a long way to improving the lives of working people in Ontario. That's something we should all support. Jordan Brennan (@JordanPWBrennan) is an economist with Unifor and a visiting research fellow at Harvard Law School.